Here we are again, enjoying one of Greenport NY’s best weekends. Happy Shellabrators strolled around downtown Greenport. The draw? Fresh shellfish prepared by participating restaurants, and wines and brews from our local wineries and craft breweries. This was the 6th Shellabration, and we enjoyed it four of the past years… 2016, 2015, 2014 , and 2013. Shellabration begins when you pick up your bracelet, which shows participating restaurants that you have helped Cornell Cooperative Extension’s Marine Program by registering and paying your fee. 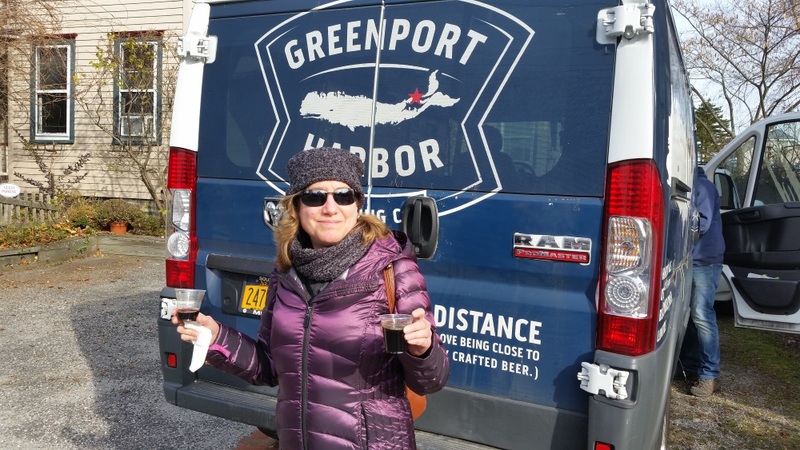 This year we used the Greenport Harbor Brewery pickup location, and enjoyed some fresh oysters and two glasses of their Oyster Stout. Come, spend a few minutes with us on our three hour stroll. Last year, American Beech served up an amazing mousse, and we expected something terrific. We were not disappointed. Our local Peconic Bay scallops in a white chocolate and grape risotto. It sounds over the top, but it was delicious. A Kontokosta riesling paired well with it. Scallops in a Chocolate Risotto? Yup! We love sushi, and Stirling Sake never disappoints. You will need to taste these scallops in Ponzu with your eyes. The sake was cold and delicious. What I remember from Shellabrations past is the smoked fish chowder at First and South. This year, we did something different, enjoying fried oysters served in endive boats, with a Macari rose. Here… try it for yourself. First and South is Festive! Located at the Greenporter Hotel, this restaurant has been reported to be closed, but was open and thriving during this Shellabration. The fried oysters (we like fried oysters!) were a different and delicious take on this dish, and were excellent. The scallops and orecchiette, pictured following, were terrific, too. Raphael Winery supplied a crisp white that complemented our tasting. Tired yet? Well, we were ready for a wrap up tasting, and headed to The Frisky Oyster. They feature “Oysters Friskafella” along with an excellent chowder, and some scallops in a spicy eggplant puree. To drink, a Sparkling Pointe bubbly . Enjoy! Yup, another Shellabration under our belts, literally. We hopped the ferries back to East Hampton, where we had what for dinner? Scallops and linguine with a delicious Rose Txakoli from Spirited Liquor, right in Greenport. Will we be at Shellabration 2018? You bet! See ya soon.